The ultimate ATV vacation destination. Camp and ride a different trail every day for weeks. ATV routes connect tiny mountain towns of Tincup, St. Elmo and Pitkin. Ride from St. Elmo Ghost Town all the way to Aspen. Descend through Aspen Ski Area, park near bottom of gondola and walk into town. Ride from Taylor Park to outskirts of Crested Butte. Precise directions, custom maps, stunning color photos and GPS waypoints. New easy-to-use format. Twenty-eight trails suitable for wider UTVs. Great for dirt bikes, too. Each trail description contains detailed GPS information (Shown in waypoint name as book P.) Set datum to:WGS84, Display as: hddd mm.mmm. 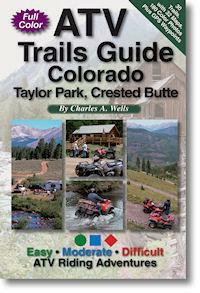 To download all trails for this book in one file to use with your GPS Click Here.